Sergey Kovalev kept coming, and Andre Ward never stopped battling. With the crowd roaring in approval, they put on a fight that lived up to its advance billing. 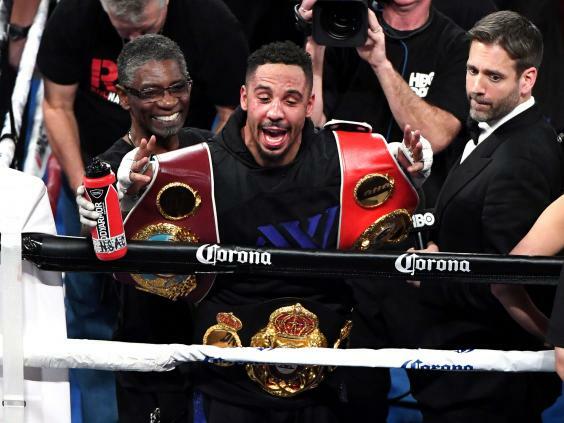 In the end, Ward won a narrow decision on Saturday night to take Kovalev’s light heavyweight titles in a battle between two unbeaten boxers. Ward survived a second-round knockdown and relentless pressure from Kovalev, doing just enough to win by a point on all three ringside scorecards. He remained unbeaten in his last 20 years in the ring, but it wasn’t without some moments of worry. “This was a beautiful thing. We did it baby,” Ward said. All three ringside judges had Ward winning 114-113. The Associated Press had Kovalev ahead 116-111. “It was a fight of my life,” Kovalev said. Ward won all of the last six rounds on two scorecards, and five of six on a third. He won the final round on two of the scorecards. Kovalev knocked down Ward in the second round and chased him around the ring much of the early part of the fight but Ward dug deep and managed to land some good punches of his own in a fight that built to a climax in the later rounds. The crowd of 13,310 at the T-Mobile Arena was on its feet in the late rounds as the two fighters went after each other, neither giving an inch. In the end, the judges favoured Ward’s counter punching against the aggressive style of Kovalev. “We were a little careless with that knockdown in the second round,” said Ward’s trainer, Virgil Hunter. “But we landed the cleaner punches,” he argued. Both fighters were unbeaten with almost identical records. Ward was 30-0 with 15 knockouts and Kovalev was 30-0-1 with 26 knockouts. It was a classic boxer versus puncher battle, and it looked like the puncher would prevail as Kovalev won the early rounds. Yet, Ward kept punching and landed some good shots of his own in the middle rounds, and there were plenty of close rounds that could have gone either way. “I knew it was going to be a tough fight — it was the 1st time in my career I was dropped,” Ward said. Kovalev’s promoter, Kathy Duva, said she would use the rematch clause in the contract for a second fight. “He won the first six rounds so I don’t know how he could lose a decision,” Duva said. “I’m happy we had a great fight. Boxing needed a great fight. The fight was billed as a matchup of U.S. and Russian fighters, with the 2004 Olympic gold medalist Ward against a Russian who lives mostly in the Los Angeles area. It was a classic matchup of puncher versus boxer, and for the early part of the fight the puncher was winning. Kovalev flashed his power early, hitting Ward with a left hand midway through the first round that briefly wobbled Ward’s legs. Ward grabbed and held on and finished the round jabbing at the Russian, but the tone of the fight was set early. Midway through the second round, both fighters threw right hands but it was Kovalev’s that landed flush to the side of Ward’s head, putting him on the canvas. He got up quickly and smiled as if not hurt but needed all of his supreme defensive skills to make it out of the round. Ward seemed unwilling to go inside after that, moving backward and trying to land jabs to control the action. 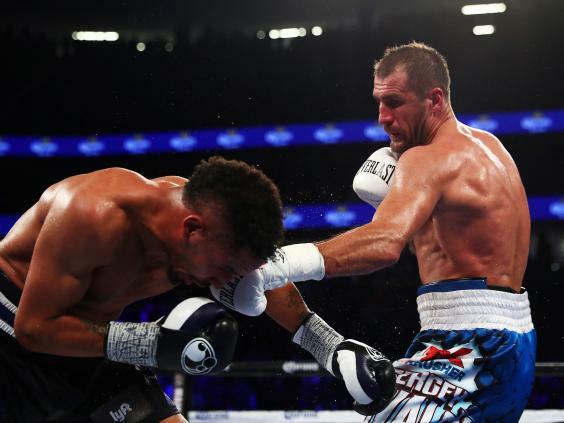 But he abandoned the style that had served him so well over the years and fought moving backward, throwing only one punch at a time, as Kovalev constantly pressed the attack. Ward did have some moments, including the seventh round when he landed a good left that snapped Kovalev’s head back. Ward earned $5 million, while Kovalev was paid $2 million plus a percentage of pay-per-view. On the undercard, two-time Olympic gold medalist Claressa Shields made her pro debut a successful one, winning a decision over Franchon Crews in a four-round super middleweight fight. Shields came back from a slow first round to land the bigger punches in an entertaining fight. Both women, fighting without headgear for the first time, traded punches freely but Shields won all over four rounds on the scorecards of the three ringside judges. Shields, who became the first American woman to win a gold medal in the 2012 Olympics and added another in Rio in August, had vowed to be impressive in her first pro fight. And she wasn’t shy about trading punches with Franchon, a Baltimore fighter who lost to her during the Olympic trials in 2012.